a name in scale, to St Christiansted, US Virgin Islands. Since we first began our cruising in St. Lucia in September, all our passages were short enough to complete between dawn departure and dusk arrival. Entering “the Virgins” marked a milestone departure. 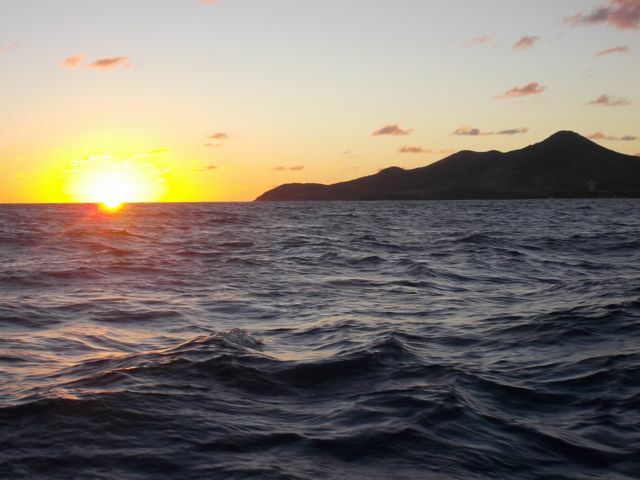 Sailing from Saba to the Virgin Island of St. Croix, was nearly 90 miles, our longest passage on Journey to date. Journey generally sails at about 5 miles / hour in light to moderate winds. A sail of 88 miles would take us about 18 hours. Currently, dawn’s breaking around 6 am, and dark’s a little before 7 pm. It would be impossible to make the trip without sailing through the night. Wayne and I sailed through the night before, but never just the two of us, and never on Journey. Another first: Wayne’s first time as captain on a night passage. installing the wheel pilot. The installation was a multi-day project. 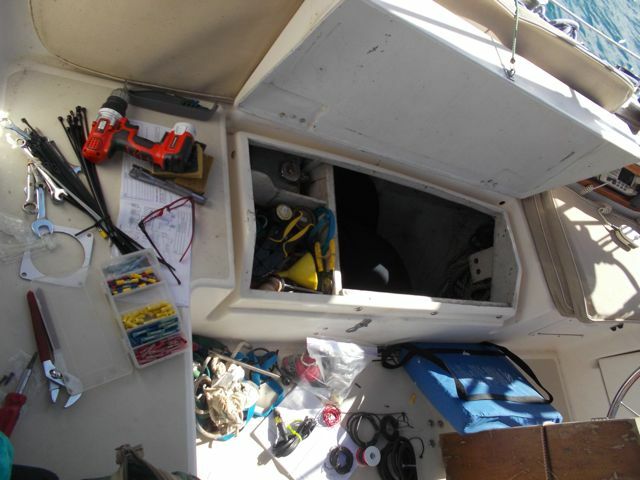 One recent development would help tremendously.… Wayne recently installed a wheel pilot (also called an autopilot), which would automatically steer the boat to a destination point. We’d test-driven it on a couple of sails already, so we knew it worked in most typical conditions. Autopilot devices are common among cruisers; but new for us. The autopilot on our O’Day and Journey were broken, so we steered manually it all the time. That meant even a brief bathroom break meant someone still had to mind the wheel. mostly hands-off steering on long passages. on our passage to St. Croix. We wanted to arrive in good light, preferably morning, to navigate our way in. Normally, we started sailing in the morning; this passage we deliberately waited until early afternoon to leave for a morning arrival. the ingredients gathered and pre-chopped. Sometimes the cabin shakes, rattles and rolls quite a bit during passages, making it unpleasant below deck and challenging to cook. Ideally, passage meals are ones easily prepared and eaten, even in roiling seas. 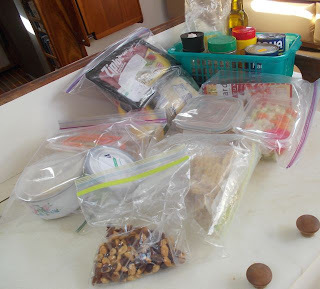 To make it easier, I prepped as much of our meals as I could ahead of time. We got a glorious start. 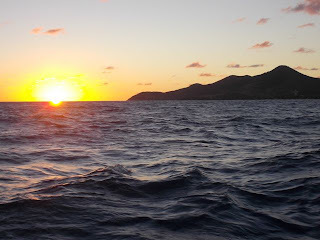 Visibility was crystal clear for 40+ miles; as we pulled away from Saba we saw the whole chain of islands we visited the month before – St. Eustatius, St. Kitts and Nevis, as well as St. Martin. Winds were gently blowing behind us, moving us easily toward our destination in moderate ways, nudging us where we wanted to go. We felt the winds shifting, so I cooked while I could, before the ride got rougher. We downed a generous serving of cassoulet, a delectable concoction of white bean, smoked pork, garlic, onion, celery, carrot, herbes du Provence, cooked in olive oil, vermouth, and chicken bouillon. Then the wind got flaky. It dropped, then couldn’t decide what direction it wanted to blow. We tried all sorts of sail combos… Port (left) side, Starboard (right) side, even wing-on-wing (a mix of port and starboard), sailing with our mainsail only, our foresail (front or job) only, sailing with both…. Finally, as darkness descended, we decided to keep it simple. We stopped trying to milk a faint and fickle wind. We turned on our stinky but reliable, predictable and steady diesel motor. The wind is free, though for us, 10 hours of sailing still burned just 5 gallons of diesel. We took turns sleeping and taking watch. Thanks to the wheel pilot and motoring without sails up, that meant at least every 15 minutes, confirming we were on course, no obstacles cropped up (other ships on a collision course, or rocks or other potentially damaging obstructions not identified for avoidance by our chart plotter) and nothing dramatic changed in the weather requiring attention. Other than our autopilot’s bearing making a slight deviation from our course line, the trip was uneventful. The late moonrise and long distance from “light pollution” (a strong, close city light glow, cutting into night vision) make for a spectacularly starry night. I passed the time working on the computer in dimmed mode, and reading via red headlamp light to preserve my night vision. Nice dawn to greet us upon our arrival into St Croix. While Wayne slept fitfully. At dawn, I confirmed by sight our auto pilot course line deviation from our chart plotted course did indeed bring us too close to land, and made amends. I woke Wayne up to guide in our final route along the St. Croix coastline and into anchorage. We were even able to unfurl our sails and give our motor a break. We know in our longer, future passages we won’t likely just motor in during my overnight shift. We’ll make sure we’re as ready as we can be for whatever challenges our future passages require. 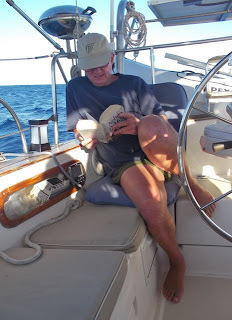 For now, I am glad this first one was relatively easy, and am grateful our next overnight passage won’t be for another couple months, until we make our 2-3 day passage to Puerto Rico. We did alright. The day was still young.… Anchoring, customs check-in, breakfast, wandering about, scoping out the island, bussing to Fredricksted and the hermit crab races (click here for more info on that– link to hermit crab races) awaited…. Note: This is a retrospective; two islands ago already! We are currently in the British Virgin Islands (BVI) in Tortola.